Juice Drop is a GIRL!!! What a total shocker! 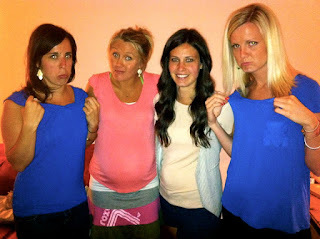 We could've sworn (even though I don't swear lol) that we were having a boy! You even heard me say it so many times! So much for motherly instincts, haha! Travis and I didn't care either way what we were having. 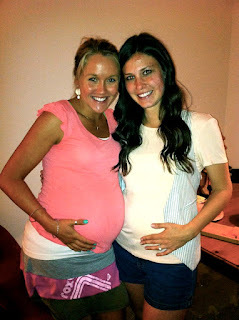 A boy would've been a joy :) but now that we know we're having a girl, well, it just kinda knocks our socks off! What a blessing this little girl already is to Travis and me. We love her so much, and now that we know that she is a she, I feel the bond between us three tightening that much more. 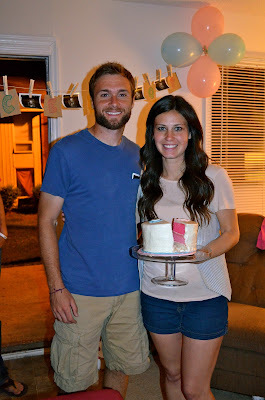 We could have found out that we are having a girl at our ultrasound last Thursday but we decided to wait until our party on Saturday--and I'm so glad we did! It made finding out so special knowing our close friends and family were with us sharing in our joy. I already know that our baby girl is going to be loved so much by so many! 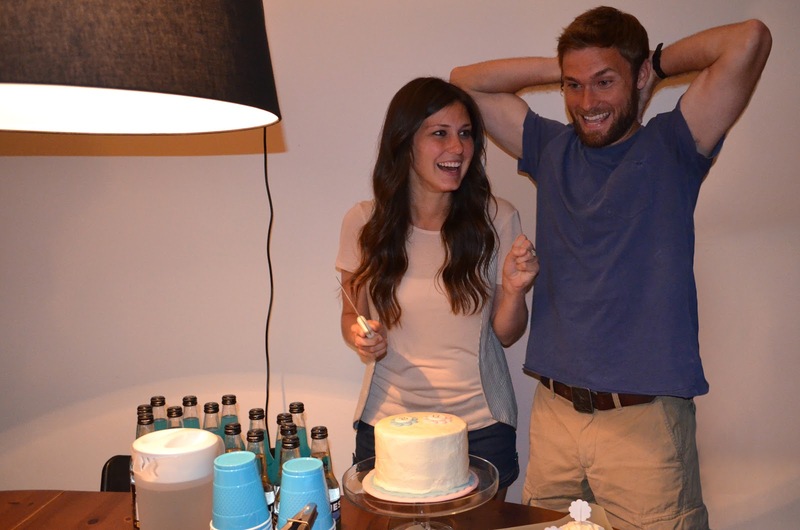 Our gender reveal party was quite the event. With over 30 people in our small living room the anticipation was making everyone giddy. Not everything went off without a hitch though--how could it when you have technology involved? Our guests were on pins and needles waiting for the cue to take a bite out of that cupcake and for us to cut into our cake, however, the Skype connection for Travis' mom was failing. We couldn't leave Grandma out of the big reveal! Finally, after a half hour, she was able to get it working and we were ready to go! But as Travis and I took that knife to the cake one of our friends who was Skyping in Uncle Troy and Aunt Carly (Travis' brother and sister-in-law), the connection was lost! It took a couple of seconds to get them back, and with my heart racing, we were all (including those Skyping in) finally ready to see what color was inside that cake! Our lovely baker, Angel (Travis' cousin's wife) baked Travis and me a cake and everyone else had their own cupcake. Inside was pink filling to reveal that we're having a little girl! Guest picked a cupcake based on what they thought we were having. We had the ultrasound technician put the pictures that revealed she's a girl in a sealed envelope and we took the envelope to Angel, so we had no idea until we cut into that cake! Just had to get Jones Soda! 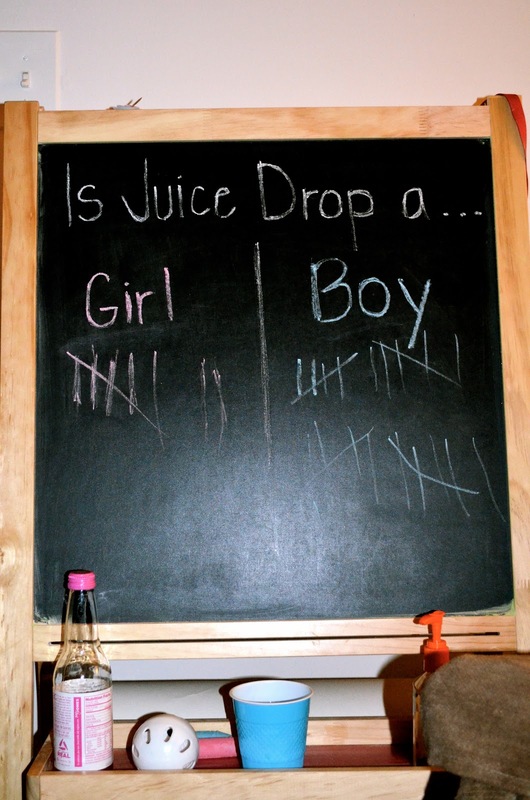 Guests voted for either girl or boy. 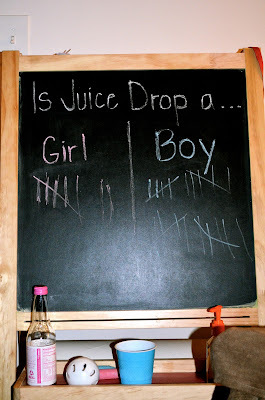 Looks like everyone else thought Juice Drop was a boy too! Travis trying to get a hold of his mom on Skype! Time to pass out the cupcakes! Jeremy just couldn't handle the excitement! He bit in before it was time, haha! Oh, the joy I felt at that moment could not be contained! I kept envisioning blue inside that cake but when I saw pink I was elated, ecstatic, and brought to tears. By the way, you can actually see Uncle Troy's expression too!! Angela and Abby chose wrong while Heather got it right! Ruffles and Bows...Here we come!